This book is volume one of two. 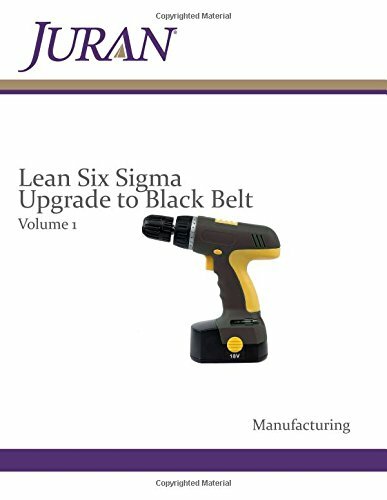 Lean Six Sigma Upgrade to Black Belt Volume 1 covers advanced statistical tools that Black Belts use during the Define, Measure, and Analyze phases of a Six Sigma Project. Volume 2 covers experimental design (Improve), advanced control charts (Control), and advanced Lean tools. Lean Six Sigma is a result of two powerful methodologies (Lean and Six Sigma) that have a complementary toolkit. Combining the two techniques with effective team skills has provided vast improvements in many organizations. The fundamental objective of Juran’s Lean Six Sigma Manufacturing curriculum is to develop a methodology and strategy that enable individuals and organizations to successfully improve processes and reduce variation. At a project level the Lean Six Sigma DMAIC process (Define, Measure, Analyze, Improve, and Control) is an improvement system for existing processes falling below specification and provides methods for obtaining breakthrough improvement. Black Belts are technical specialists assigned full responsibility to implement Lean Six Sigma projects through a business unit, function, or process. They are viewed as initiators of improvement activity, and are full-time on-site project leaders. Lean Six Sigma Green Belt Manufacturing is a prerequisite. Juran Global is a US based, internationally-acclaimed, business improvement consulting and training organization founded as Juran Institute in 1979, by Dr. Joseph M. Juran. Dr. Juran was one of the most internationally recognized pioneers and visionaries in attaining business results through the management of quality as viewed by the customer. The new Juran Global under the leadership of Joseph A. DeFeo M.B.A., Dr. Juran’s contemporary, is providing these materials for the global marketplace to assure Dr. Juran’s methods are properly presented for maximum results. Juran Global is available to conduct this workshop at your location, anywhere in the world or through our distant learning programs. Juran Global offers best-in-class assessment, benchmarking, consulting, and training services to implement operational excellence programs aimed at improving business results. Our services include assessment tools that benchmark against international best practices, and training programs to deploy operational excellence, change management, and quality management.